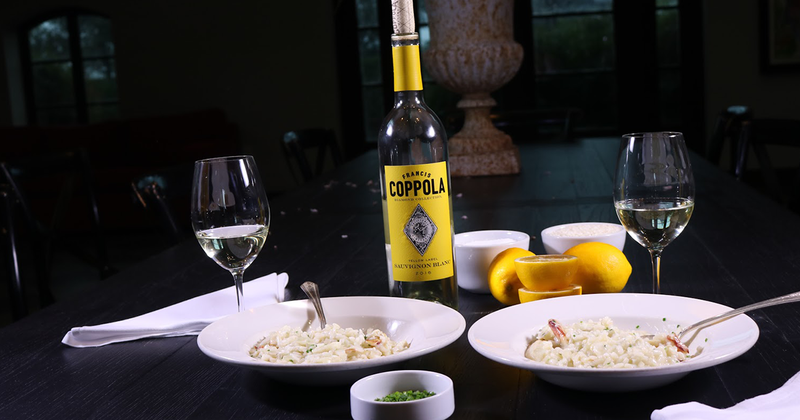 Welcome to the first installment of Bodellicious Bites, a new blog series from Tim Bodell, Culinary Director of RUSTIC, the award-winning restaurant at Francis Ford Coppola Winery. In each post, Chef Tim will share his passion for culinary adventures with personal recipes, cooking tips, sustainable farming techniques and more. It is one of the most celebrated and anticipated of native, Sonoma County ingredients. There are so many ways to prepare the mighty Dungy- simply boiled and served with drawn butter, crab cakes, crab fritters, crab salad, and the list goes on and on. I think the most important thing to remember when preparing crab- keep it simple and let the sweet and delicate flavor of the crab shine through. Preheat a sauteuse or other wide bottom pan over medium- high heat. Add olive oil to the preheated pan and then add onions, salt, and pepper. Cook onions until translucent and then add the rice. Stir the rice grains with the olive oil and onions until they begin to appear slightly toasted. Deglaze the pan with the glass of Sauvignon Blanc and reduce by half. Begin adding the water to the pan ½ c. at a time, stirring frequently. Repeat until all the water is used up of the rice is cooked to a nice al dente. Finish the risotto with the butter, mascarpone cheese, lemon juice, crab meat, and chives and season to taste with salt and pepper. Makes 4 servings.